We attended a few different celebrations for the Chinese Mooncake Festival / Mid Autumn Festival / Lantern Festival that marks a celebration of unity around Singapore. 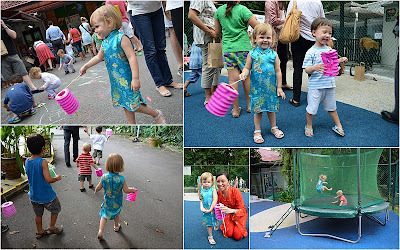 This celebration follows the Hungry Ghost Festival, which is similar to Halloween, but goes on for about a month and the deceased are offered gifts. Every year on the fifteenth day of the eighth month of the Chinese Lunar Calendar, the Chinese celebrate the Mooncake Festival. Mooncake shops are set up all over the city for sale in intricate boxes in a variety of flavors. Mooncakes are traditionally eaten during the Mid Autumn Festival. It is regarded as an indispensable delicacy on this occasion and are offered between friends and family, while gathered to celebrate. 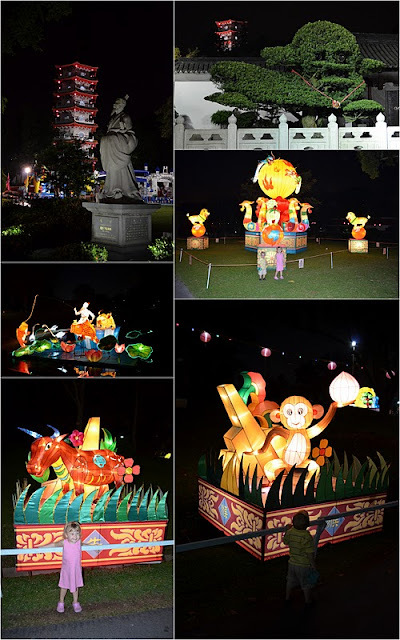 The festival is also celebrated at night with lantern displays and dragon dances. Lantern riddles are written on the lanterns. 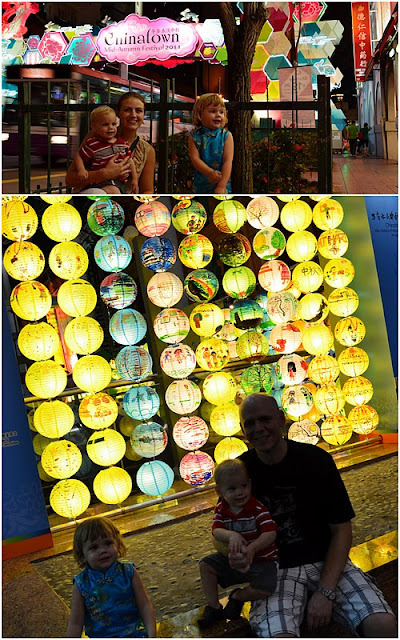 The Chinese Gardens had oversized lanterns glowing throughout the park. It was brilliant with the pagodas in the backdrop and the reflections off the still lakes. There were also plenty of children's activities from rides, games and bouncy castles, to sparklers and light up wands and balloons.